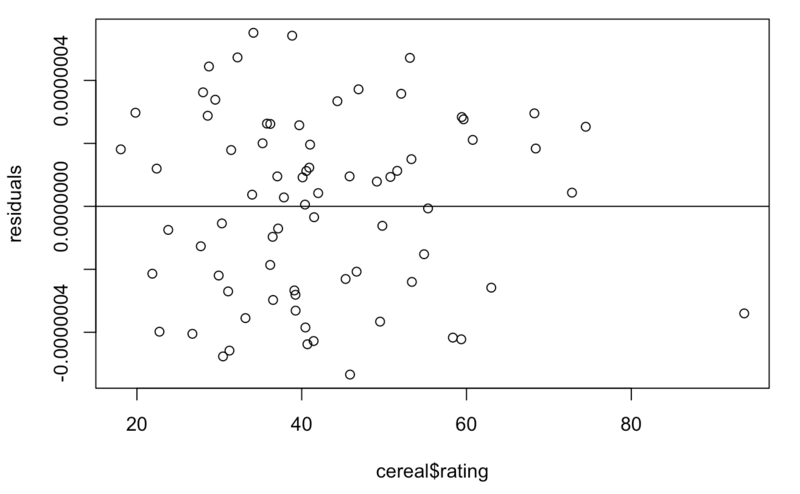 Kaggle cereal data set - Rating seems to be a function of other predictors? I did some regressions and, unless I made a big mistake somewhere, it looks like the rating field is a function of a few other predictors. Here is the regression equation I came up with. Notice that all of the predictors have very low p-values and the R^2 is close enough to 1 that R just shows 1. Is this an indicator that the rating is just a function of these other predictors? Browse other questions tagged regression or ask your own question. How to perform multiple regression when one predictor is the sum of two other predictors? How to use old data with a different rating scale from the new data? What should I do about this regression analysis? Which function represents this set of data?